Honda Accord has for so long been a best-seller in the popular midsize sedan segment that nobody remembers speaking about mass-market sedans without mentioning the Accord. But something happened to shake up the midsize-sedan party. The hand-grenade heaved into the crowd was the shapely form of Hyundai’s 2011 Sonata, which launched early this year. Sonata came gunning for the market’s stalwarts with a refined new platform, aggressive pricing and expressive styling that made the Accord and Toyota’s Camry (both in the middle of their current generation lifecycles), look like cinder blocks. Honda, however, is benefiting from what’s known in the industry as a “mid-cycle” refresh. The styling of the 2011 Accord isn’t nearly pushing as far up the “rad” meter as the Sonata, but some tweaks across the line — not to mention the addition of the well-priced and well-equipped SE trim — give the 2011 Accord more ammunition. All 2011 Accords get a revised, gently sharpened grille and front bumper and devoted brand fanboys will note a different trunk lid and a new wheel design. The higher-trim EX-L V-6 Accords now have steering-wheel-mounted paddle shifters. And proving how difficult and pricey it must be for automakers to upgrade today’s quickly outdated electrical architectures, you have to choose a high-level Accord to enjoy a USB audio interface — now an expected item even in entry-level subcompacts. The 2011 Accord SE, our tester, with its 177-horsepower, 2.4-liter four-cylinder engine is the upper low-end of the Accord range, which includes a lineup with a 271-horsepower, 3.5-liter V6. 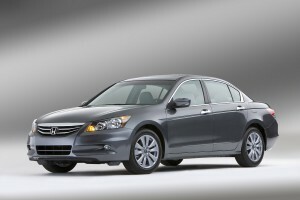 The Accord SE is a well-equipped package whose main bragging point is a Sonata-bustin’ price of less than $25,000. That’s a good hunk of Honda-ness for the price, with the SE trim including a quite-nice grade of leather for all seats and the steering wheel, as well as heaters for both front seats. To spec out a Sonata with equipment similar to the 2011 Accord SE would cost at least a couple thousand dollars more. The Sonata cranks another 21 helpful horses out of its Direct Injection four-cylinder of the same size as the Accord. For all of Honda’s vaunted engine-development prowess it’s trailing in this latest powertrain technology. But for budget-minded customers, not having Direct Injection weighs to their advantage as a price-cutting measure, so they’re not going to miss a couple dozen horsepower. Additionally, Honda reports the I-4 engine gains in fuel economy ratings with the five-speed automatic transmission. The Accord SE is a hospitable and responsive driving partner. Cornering limits are modest and safe, while acceleration — 0-to-60 mph in a leisurely 9 seconds or thereabout — is on the acceptable side. The fairly expensive-looking leathered interior is contrasted by a simple dual-gauge cluster and a center console layout that some might call stark if its utter straightforwardness didn’t remind us that this is about all you need.